A Unusual Pair of 18th Century French Finial Architectural Elements - C. Mariani Antiques, Restoration & Custom, San Francisco, CA. 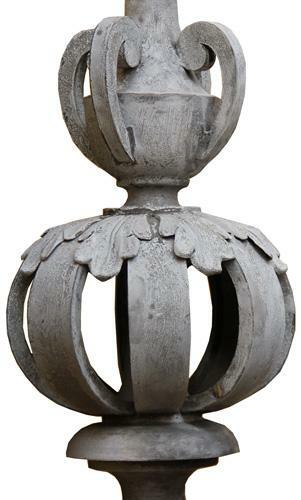 An Unusual Pair of 18th Century French Finial Architectural Elements, made of spelter, with an acorn finial above fretted spherical elements and with detailed metal work throughout, raised on conforming pedestals. This pair would be handsome flanking an entry or converted into floor lamps. Height: 86"; Width: 11"; Depth: 11"